Creep Street "Stacks on Stacks!" Creep Street dropped their long awaited Summer 2012 “Frisky Business” line last week, and they didn’t disappoint. 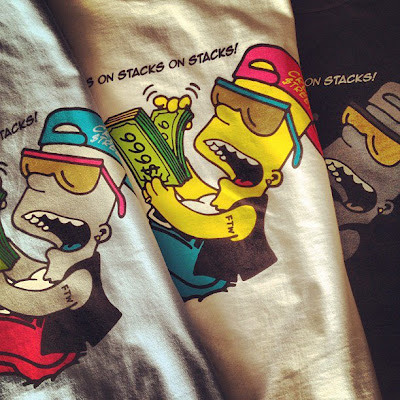 I’m a huge fan of “Stacks on Stacks!,” showing some Simpsons love. I can’t decide between the white or light blue t shirt (I’m only passing on the black because about 1/3 of my closet is filled with black shirts). And if your ordering anyway, you might as well pick up the “Death From Below” frisbee, the dopest frisbee you’ll ever find for $7. Visit Creep Street’s Little Shop of Horrors or Karmaloop.com (use code NOMAS for 20% off your first KL order) to get frisky.